The indigenous peoples of North America built substructure mounds for well over a thousand years starting in the Archaic period and continuing through the Woodland period. Many different archaeological cultures (Poverty Point culture, Troyville culture, Coles Creek culture, Plaquemine culture and Mississippian culture) of North Americas Eastern Woodlands are specifically well known for using platform mounds as a central aspect of their overarching religious practices and beliefs. These platform mounds are usually four-sided truncated pyramids, steeply sided, with steps built of wooden logs ascending one side of the earthworks. 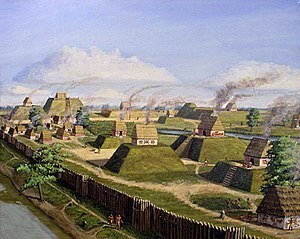 When European first arrived in North America, the peoples of the Mississippian culture were still using and building platform mounds. Documented uses for Mississippian platform mounds include semi-public chief's house platforms, public temple platforms, mortuary platforms, charnel house platforms, earth lodge/town house platforms, residence platforms, square ground and rotunda platforms, and dance platforms. Many of the mounds underwent multiple episodes of mound construction, with the mound becoming larger with each event. The site of a mound was usually a site with special significance, either a pre-existing mortuary site or civic structure. This site was then covered with a layer of basket-transported soil and clay known as mound fill and a new structure constructed on its summit. At periodic intervals averaged about twenty years these structures would be removed, possibly ritually destroyed as part of renewal ceremonies, and a new layer of fill added, along with a new structure on the now higher summit. Sometimes the surface of the mounds would get a several inches thick coat of brightly colored clay. These layers also incorporated layers of different kinds of clay, soil and sod, an elaborate engineering technique to forestall slumping of the mounds and to ensure their steep sides did not collapse. This pattern could be repeated many times during the life of a site. The large amounts of fill needed for the mounds left large holes in the landscape now known by archaeologists as "borrow pits". These pits were sometimes left to fill with water and stocked with fish. Some mounds were developed with separate levels (or terraces) and aprons, such as Emerald Mound, which is one large terrace with two smaller mounds on its summit; or Monks Mound, which has four separate levels and stands close to 100 feet (30 m) in height. Monks Mound had at least ten separate periods of mound construction over a 200-year period. Some of the terraces and aprons on the mound seem to have been added to stop slumping of the enormous mound. Although the mounds were primarily meant as substructure mounds for buildings or activities, sometimes burials did occur. Intrusive burials occurred when a grave was dug into a mound and the body or a bundle of defleshed, disarticulated bones was deposited into it. Mound C at Etowah has been found to have more than 100 intrusive burials into the final layer of the mound, with many grave goods such as Mississippian copper plates (Etowah plates), monolithic stone axes, ceremonial pottery and carved whelk shell gorgets. Also interred in this mound was a paired set of white marble Mississippian stone statues. ^ Owen Lindauer; John H. Blitz (1997). "Higher Ground: The Archaeology of North American Platform Mounds" (PDF). Journal of Archaeological Research. 5 (2). Retrieved 2011-11-02. ^ a b Raymond Fogelson (September 20, 2004). Handbook of North American Indians : Southeast. Smithsonian Institution. p. 741. ISBN 978-0-16-072300-1. ^ a b Henry van der Schalie; Paul W. Parmalee (September 1960). "The Etowah Site, Mound C :Barlow County, Georgia". Florida Anthropologist. 8: 37–39. ^ Gregory Vogel. "Cavanaugh : A Late Prehistoric Platform Mound in Western Arkansas". Archived from the original on 2012-04-15. Retrieved 2011-10-26. ^ "Alabama Archaeology: Prehistoric Alabama". Archived from the original on 2011-12-23. Retrieved 2011-10-26. ^ Skele, Mike (1988). "The Great Knob". Studies in Illinois Archaeology. Springfield, Illinois: Illinois Historic Preservation Agency (4): 102–103. ISBN 978-0-942579-03-1. Rice, Glenn; Redman, Charles (1993). "Platform mounds in the Arizona Desert" (PDF). Expedition. University of Pennsylvania Museum of Archaeology and Anthropology. 35 (1). Pursell, Corin (2004). Geographic distribution and symbolism of colored mound architecture in the Mississippian Southeast (Masters) (Thesis). Southern Illinois University Carbondale. Payne, Claudine (1994). Mississippian capitals : an archaeological investigation of Precolumbian political structure (PDF) (Doctoral thesis). University of Florida. John H. Blitz; Patrick Livingood. "Sociopolitical implications of Mississippian mound volume" (PDF). American Antiquity. Steven Porth. Raised ground, Razed structure :Ceramic chronology, occupation and chiefly authority on Mound P at Moundville (Masters) (Thesis). pp. 11–12. Kitt Chappell; Sally A. (2002). Cahokia : Mirror of the Cosmos. pp. 51–65. ISBN 978-0-226-10136-1.